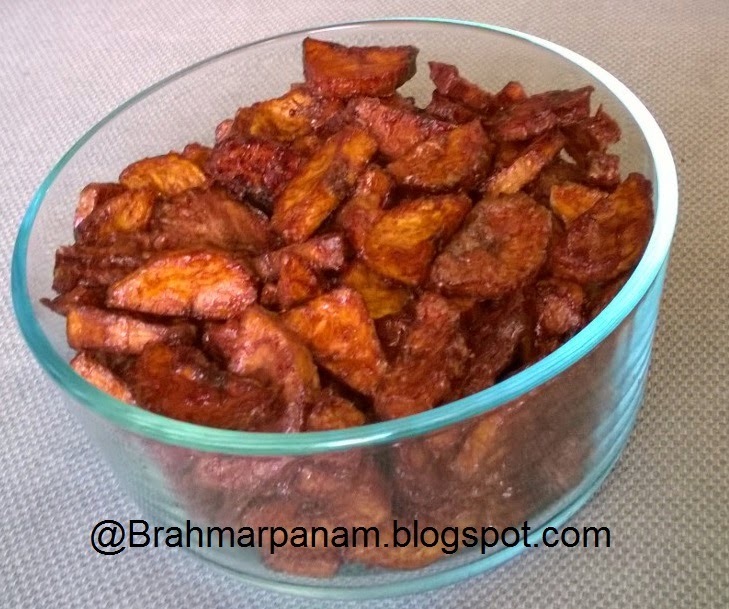 This is a sweet snack famous in Kerala and another inevitable part of a Kerala Sadya. Peel the Raw Bananas and soak them in water mixed with turmeric for around 10 min and then pat them dry. Cut each of banana into half lengthwise and then into small pieces of 1/4" thickness. Heat oil in a wok and carefully drop the pieces into the oil. Fry the pieces in batches till they are crisp and remove them with a slotted spoon and place them on a paper towel to drain the excess oil. Take a big pan and add the jaggery with 1/2 cup water and allow the mixture to boil. To check if it has reached the desired consistency, add a drop of the jaggery mixture in a bowl of cold water. You should be able to make a small ball from it without it melting into the water. Add the cardamom and ginger powder and stir well. Then simmer the stove and add the fried banana pieces into it with continuous stirring. Once the chips are covered with jaggery, switch off and add the rice flour and sugar and mix well. Transfer the mixture into a wide plate and allow it to cool completely. Once cooled, transfer it to an air tight container and enjoy! !